i can barely tell.. and 1cm is so tiny that you may be able to get it to look a little less wonky upon blocking, i think. isn't yarn dominance crazy? i love it! looks incredibly neat apart from that though. My colorwork never looks like that. I'm sure it won't matter: people aren't really going to be going round staring at your legwarmers on the tube...are they?? 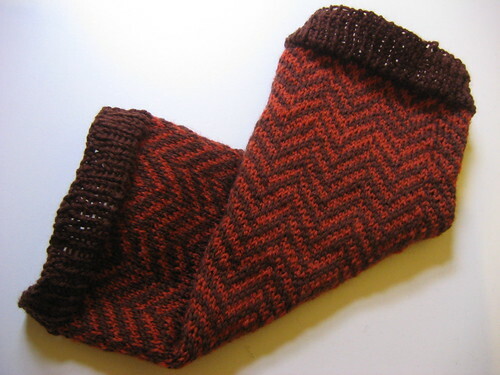 All your legwarmers have made me want to make some too. I may be copying your mermaid ones yet. We shall see. Oh, that was a cool link. Thanks! I can't really tell either...yarn dominance is such a wacky thing!!!!! Would have never noticed had you not pointed it out! But it looks great and I love the zig zag pattern. Love the item, and many of the items you posted on other pages.